The other day, Nick and I were shopping at Trader Joe’s – I really like TJ’s – they have a lot of really great quality items and of the most part their prices are better than most other grocery stores we frequent. I also like how they carry interesting and different things sometimes, like what we tried tonight. Chocolate Cheddar Cheese. What?! Yes! Crazy, huh? When we saw this, we had to get it. As I unwrapped the cheese, I tried to smell any chocolate from it, but just smelled cheddar. 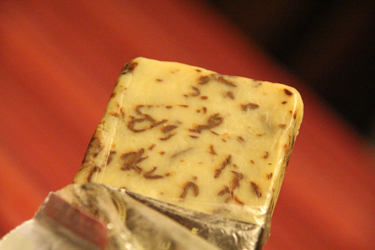 That was fine – I wasn’t sure how much the chocolate could stand out apart from such a strong cheese as cheddar anyway. 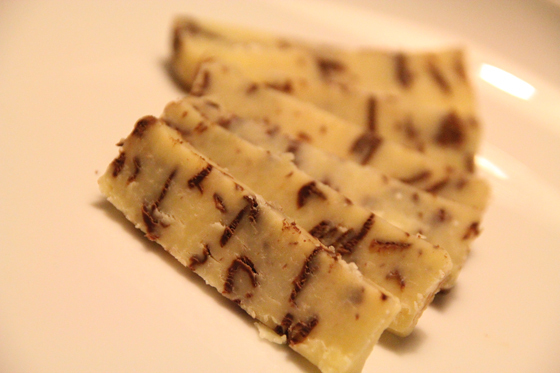 The cheese is kinda pretty, in my opinion, with the chocolate curls in it. I tried a piece. At first, I didn’t get much chocolate flavor. Nick commented that he didn’t know why they would choose to put these two flavors together. I assumed it was basically just to sell to chocoholics, or weirdos like us who just wanted to try something crazy. I liked it, but I felt like the chocolate didn’t stand out too much. I thought it could stand to have a bit more chocolate or maybe a milder cheese – but I did like it – something interesting, not disgusting, and a cool thing to bring to a gathering, if for conversation factor alone, even if the flavor wasn’t remarkable. But as I kept trying the cheese, the chocolate/cheddar combination totally grew on me more. 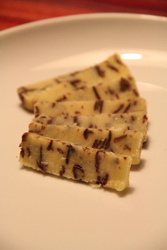 The mellow richness of the chocolate rounded out the sharpness of the cheddar in such a delicate way. 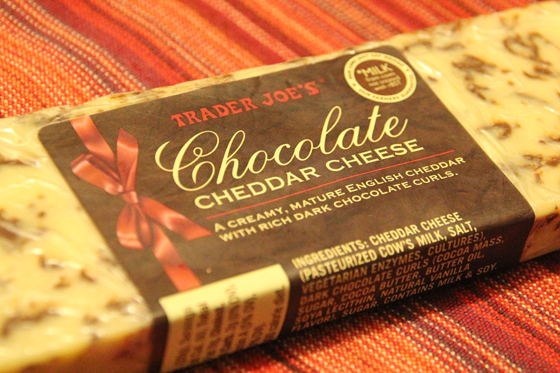 The chocolate didn’t have to hit you over the head – it was supposed to be chocolate in cheese, not cheese in chocolate, after all – and I really began to like this chocolate cheddar. We had some straight Kerrygold sharp cheddar in the fridge too, so we had a little of that, and then when I went back to the chocolate cheddar, I realized it actually was just a tad sweeter (the cheddar itself) as well. Overall, this cheese really is fun, different, and worth trying. Yum! I’ll be up to taste some!